San Diego Comic Con continues to draw ever closer, bringing with it a large selection of exclusives that fans will be quite eager to get their hands on. Beast Kingdom will be one of the many companies setting up shop at the show this week, and they're bringing along a trio of fantastic figures that DC Comics fans are certain to get excited over. Late last week, we took a look at the very striking Justice League Special Color Superman figure, which took Henry Cavill's Man Of Steel and gave him the early 90's Death Of Superman treatment by slapping the Last Son Of Krypton with a sleek black and silver suit. 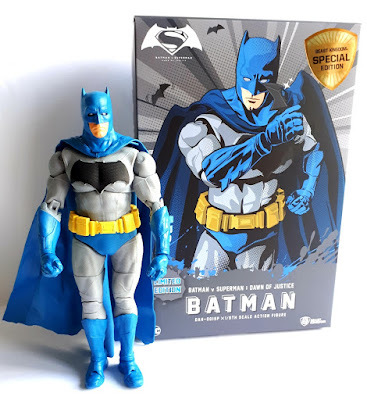 Now, we're going to be taking a look at the next Beast Kingdom exclusive for the year with the DAH-001SP Batman v Superman: Dawn of Justice Batman Comic Color Figure - which sends Batfleck back to the ice cold winter of 1986 and pays homage to one of Frank Miller's most iconic stories - The Dark Knight Returns. Published as a four issue miniseries beginning in February of 1986, The Dark Knight Returns is an alternative story of Bruce Wayne, who comes out of retirement at the age of 55 to take up the mantle of The Batman once again. Throughout the series, we follow Bruce Wayne as he battles a new street gang known as The Mutants, enlists the help of a new Robin in the form of Carrie Kelley, and eventually comes to blows with the Man Of Steel himself. During its four month run, The Dark Knight Returns also saw Bruce Wayne dealing with the onset of old age, his feelings of guilt over the death of former Robin Jason Todd ten years prior, and finally saw him giving in to and killing The Joker once and for all. The story would aid in reinventing Batman for a new age, going down in history as one of the Caped Crusader's most essential stories - a title that still stands more than three decades later. The Comic Color Batman is a San Diego Comic Con exclusive figure made available strictly through Beast Kingdom. He's crafted in 1/9 scale, and stands just about 7.2" tall. The figure is based on Ben Affleck's portrayal of the Caped Crusader as seen in Zack Snyder's Batman v Superman: Dawn Of Justice, but with a classic silver and blue paint scheme as seen in The Dark Knight Returns. While this one doesn't include an unmasked head sculpt, it won't take long to decipher which big screen Batman this particular figure uses as a template. The facial sculpt is as stern as one would expect from a Batman figure, while the cowl sports salient white eyes, short ears, and some very subtle sculpting details spread throughout. It certainly comes across as a rather accurate likeness, though given what Beast Kingdom was able to pull off with their Superman figure, we must admit that we would've loved for them to take a crack at Ben Affleck's likeness for this particular exclusive. 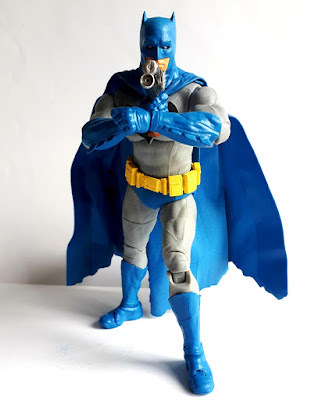 As we said above, this particular figure is based off of The Dark Knight Returns, and so he features the classic Frank Miller inspired blue and silver costume, which looks as though it was ripped right out of the pages of the famed miniseries. 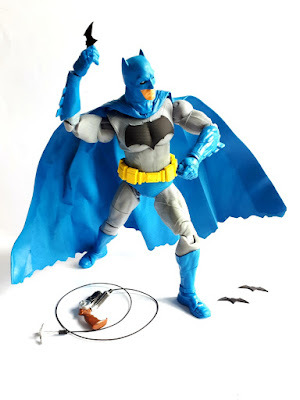 Beast Kingdom has perfectly captured the look of Miller's broken and weary Batman with this exquisite figure. The costume features a bold black bat emblem emblazoned across the chest, which is raised slightly, and features some subtle texturing for depth. In addition, the suit features classically inspired blue trunks, gauntlets, boots and cowl. A hefty utility belt also sits around the waist. 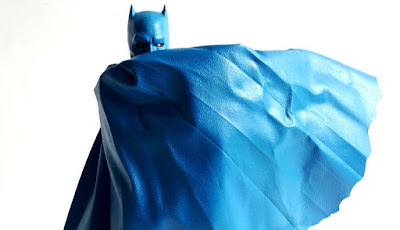 Also present with this figure is Batman's iconic cape, and Beast Kingdom has strayed away from the softer rubber of most releases of this caliber and opted for a very nice pleather-like piece. It's light, but still feels like a quality crafted extension of the costume. Additionally, the cape even features a wire within that allows fans the option of custom posing. It's one of the standout points that make up this action figure, and does it ever look sharp when being photographed! 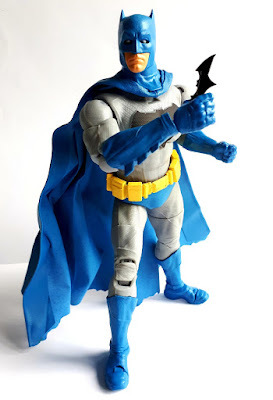 In fact, we were able to take said cape and wrap around the entire front of the figure in a very classic Emerging From The Shadows type look as depicted in numerous DC Comics titles over the years. Additionally, as the cape is crafted of a sturdier material than the thin, clothier stuff featured on Superman, there's no need to worry about the wire coming loose and poking through while posing. 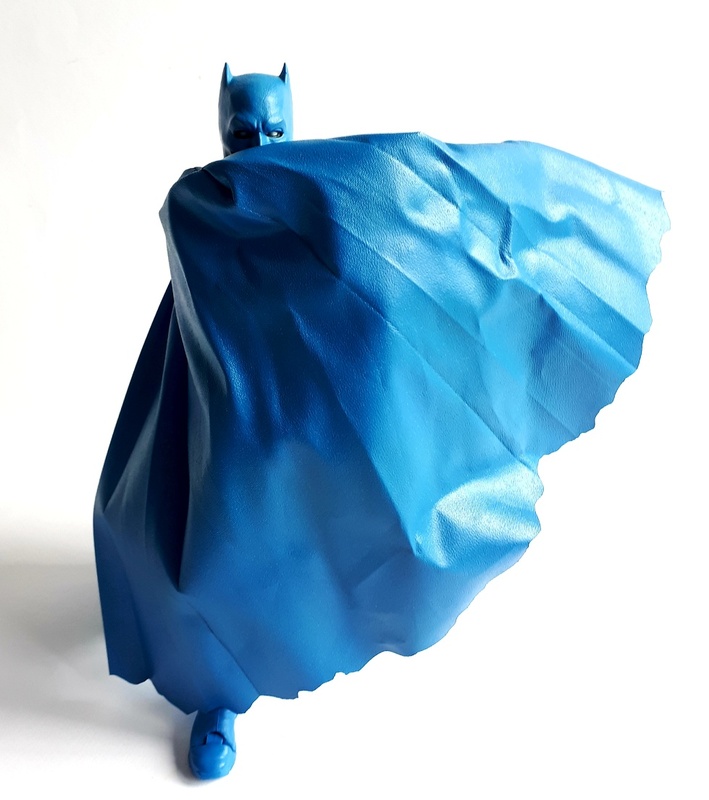 The cape is firmly attached to the shoulders of the figure and, given that it's made up of softer material, it doesn't hinder the overall articulation in any way. It's a really nice extra touch for an already very impressive action figure, and we can't thank Beast Kingdom enough for going the extra mile in crafting this iconic piece of DC history. This exclusive Batman figure also features some nice sculpted details throughout its body. These include the imposing pectorals, sculpted abdominals, and beefy biceps as depicted on Ben Affleck's big screen Batman. These added extras add some very nice depth to an already impressive piece, and the addition of some subtle dry brushing really help these additional details really stand out, even when simply standing idle on a shelf. The paint applications spread throughout are all beautifully done. Every color is expertly applied, and there are absolutely no issues regarding bleeds, smears or smudges to speak of - and trust us, we looked! The artisans at Beast Kingdom have really taken their time with this one, and the end result is downright impressive to see in person. As if the sculpt wasn't already impressive enough, Beast Kingdom has also loaded up this Batman exclusive with articulation. This classically inspired Dark Knight features 30 moveable points, offering numerous posing options for fans and collectors alike. Fans will be able to locate movement almost everywhere on this piece including the head, neck, shoulders, biceps, elbows, arms, wrists, midsection, waist, thighs, legs, knees, feet and toes. Given that this is a high quality Comic Con exclusive, fans should not be surprised to learn that the joints are nice and tight. They can be manipulated easily, and hold nice and strong even after repeated usage. However, we will note that the joints on this particular piece were somewhat stuck upon removing him from the box. Now, while the appendages are designed to pop off to prevent breakage, we feel the joints could very well snap if not treated with kid gloves the first few times. As such, we'd recommend using a hair dryer to soften things up a tad before posing the first few times. Regardless of this small discrepancy, the overall strength of the joints on this particular figure is something more that fans should appreciate about this piece, as it looks to offer a long shelf life without having to worry about things loosening with repeated posing and the passage of time. 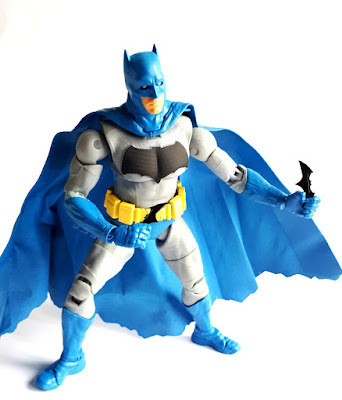 Moving on past the figure itself, Beast Kingdom has also included a number of additional accessories with this all-new Comic Colored Batman figure. Alongside the figure, they've also included a total of seven interchangeable hands. These all feature a nice coat of classic blue paint, and match the coloration of the figure very well. Along with the regular gripping hands that come attached to the figure straight out of the box, Beast Kingdom has also included a pair of fists, a pair of open hands and a hand specifically meant for holding the includes grapnel gun accessory. Also included are three diecast metal batarangs, the aforementioned grapnel gun, and a hook and wire attachment for the grapnel gun. Each accessory is very nice and can be held by the figure with relative ease. Each piece seems like an appropriate extra to include with this figure, however we really would've liked to have seen Beast Kingdom also include the grenade launcher from their previous Batfleck figure. However, as the old saying goes, you can't have everything. Beast Kingdom has also included a very nice display stand and a clear articulated arm. The stand is black, and features the logo for Zack Snyder's Batman v Superman: Dawn Of Justice. Alongside the stand, there is also a clear articulated arm that will allow for added stability when posing and displaying. It's a really nice little extra to include with the figure, and features a ratcheted joint that holds nice and tight despite repeated use, and is a really nice quality overall. All these extra accessories come encased in a plastic baggie within the box, and everything comes to you in a dual layer plastic tray. This tray is, in turn, slipped into some very beautiful packaging. While not as striking as the all-black box featured with the Black Suit Superman, Batman comes encased in a box featuring a grey and black burst in the background, and a semi-cel shaded image of Batman gripping one of his trusty batarangs. The Batman v Superman: Dawn Of Justice logo is also present on the front of the box, along with a pair of the winged creatures that inspired the timeless identity of Bruce Wayne's costumed alter ego. Adding to the fact that this is a San Diego Comic Con exclusive, and not the regular Beast Kingdom Batman figure that we've seen before, the company has also plastered a few special stickers on the box declaring this piece a limited edition only available at the convention. We also must take this moment to thank Beast Kingdom for really putting some thought into the overall packaging design. It's collector friendly in every sense, and gives fans the option to return the Dark Knight back to his little cardboard and plastic dwelling with ease once your done saving Gotham City from the forces of evil. Everything stashes away very nicely once it has been removed, and it really makes us wish that more companies would follow in the footsteps of Beast Kingdom and elect for such sensible packaging. So, in conclusion, Beast Kingdom has once again created a quality exclusive for San Diego Comic Con, and we were very impressed with the final product. The sculpting is strong, the paint and detail absolutely flawless, and the articulation is both plentiful and strong! Fans of Ben Affleck's Caped Crusader and Frank Miller's classic story will be hard pressed to find a figure elsewhere that so perfectly amalgamates the two characters so perfectly! Beast Kingdom has done an absolutely standout job with this second exclusive, and we're sure that many fans will be eager and happy to purchase him through the Beast Kingdom booth beginning this week. This is easily one of the strongest Batman figures that we've ever had the privilege to look at. In fact, we'd go so far as to declare it the best one to date! This is an action figure truly worthy of the Caped Crusader. Overall: "A convention exclusive that perfectly combines two versions of the Dark Knight into one seriously solid figure that fans are sure to appreciate." The DAH-001SP Batman v Superman: Dawn of Justice Batman Comic Color Figure will be available for purchase through the Beast Kingdom booth at San Diego Comic Con beginning Thursday, July 19th, while supplies last! San Diego Comic Con is being held from July 19th - 22nd. Special thanks to the fine folks over at Beast Kingdom for sending the sample used in this review! And to Katie Passfield for taking the pictures used in this review! Please let us know what you thought of this review!